Samgine has now published the third puzzle in this series. 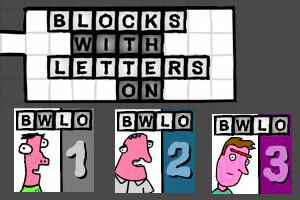 Blocks With Letters On is a series of puzzles that are both word games and logic puzzles combined where you solve and an anagram and then move the letters through a maze of challenges to spell out the correct answer. I’ll warn you up front, you will either love these puzzles or hate them. For those who love these type of challenges they don’t come much better. There is a strong following for the series but even the “die hard’s” can get frustrated. That said, the frustration is amply rewarded when you solve each level. Its strange, but we are all wired differently and what might seem and easy level to some will be a major challenge for others. Move on to the next level and the situation can easily reverse between players. Personally I do believe that it is worth persevering because these are challenging puzzles but you will feel a great sense of achievement when you solve the level. Take your time. Spread the levels out and give your brain a rest because there are hours of head scratching challenges for you. If you get stuck we do offer some assistance. If you just can’t crack the anagram take a peak at the solutions and then take on the logic puzzle aspect of the level. If you haven’t played any of this series before I would recommend that you start with the first series and work your way through. One cautionary note. The developer, Marty Sears, is English so look out for the occasional English, english spelling and word definition. This should not deter US player but just be aware of this if you find your struggling over a word. One last point. These puzzle also have a humorous side to them so look out for a few laughs along the way too. Marty is working on a fourth in the series and has said it is his favorite so keep an eye out for when that one is available.